Here's a stunning time-lapse video of the North Carolina Outer Banks, done by Daniel Lowe, who obviously has great skill and talent. 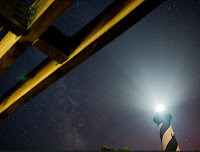 The shots he has captured of the night sky over the ocean, right alongside the fierce beams of light cast by the Cape Hatteras Lighthouse, is just stunning; and the music that accompanies this beautiful example of time-lapse cinematography further impresses upon the viewer the incredible, awesome beauty that is there, all laid out for any of us small and ephemeral human beings who are willing to take the time to go. Watch this video, and it will make you want to head to the coast as soon as possible to see it all for yourself.